It’s been one of those winters out West where we’ve been watching snow pile up at many of our warehouse locations, and even our lower elevation headquarters in Angels Camp, California saw some flakes this season. Add to that, above average snowpack numbers in every region we operate, and it’s clear we’ve got another banner whitewater year ahead. As we launch our first trips of our 50th Anniversary season this month, we’re thrilled that 2019 is shaping up to be an exceptionally good whitewater year. 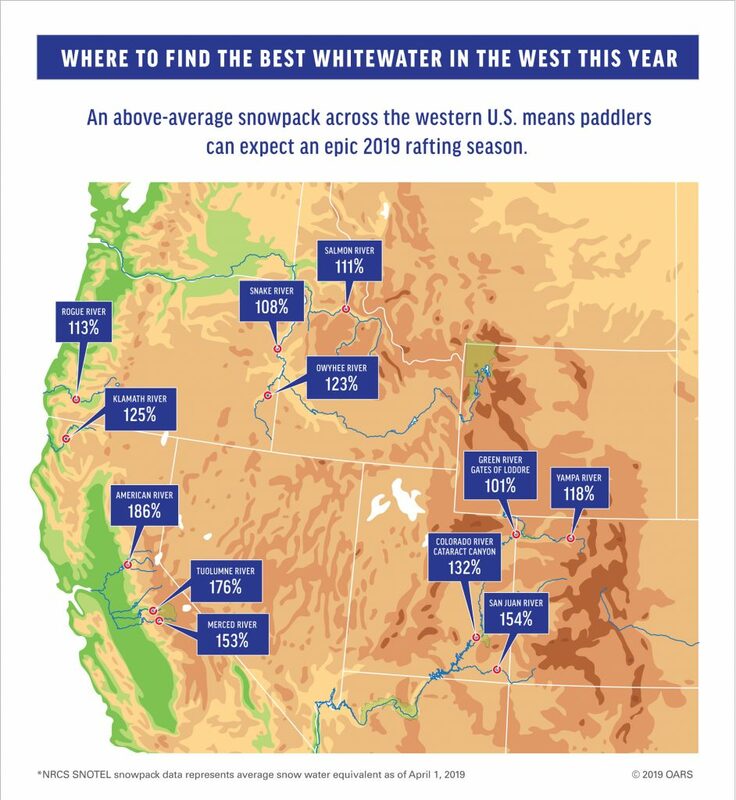 As always, we checked in with our regional managers so we could give rafters the inside scoop on some of the West’s most popular whitewater trips and what to expect during this exciting high-water season. With an above average snowpack across the West, outfitters are already likening 2019 to the 2017 and 2011 seasons. The difference between those two high-water years, and what we’ll be keeping an eye on, is the weather pattern over the next 6-8 weeks. In short, if we get more snow and temperatures stay cooler, we’ll be looking at conditions like 2011. If things warm up more quickly, we’re going to have a quick and fierce melt like 2017. Either way, we’ll have a solid high-water window with exciting conditions for the ultra-adventurous on many trips throughout the West. 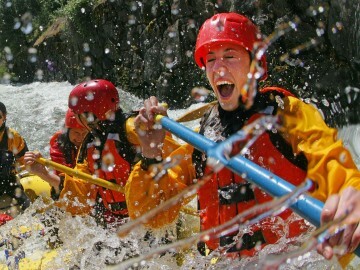 If this sounds like a good fit for you, here’s what you need to know about high-water rafting trips. Families and people looking for a fun, but more leisurely pace this year should consider planning rafting trips from July through September when river levels across the West should return to normal flows. Or, look to rivers like the Rogue in Oregon, California’s Lower Klamath, and Utah’s San Juan. 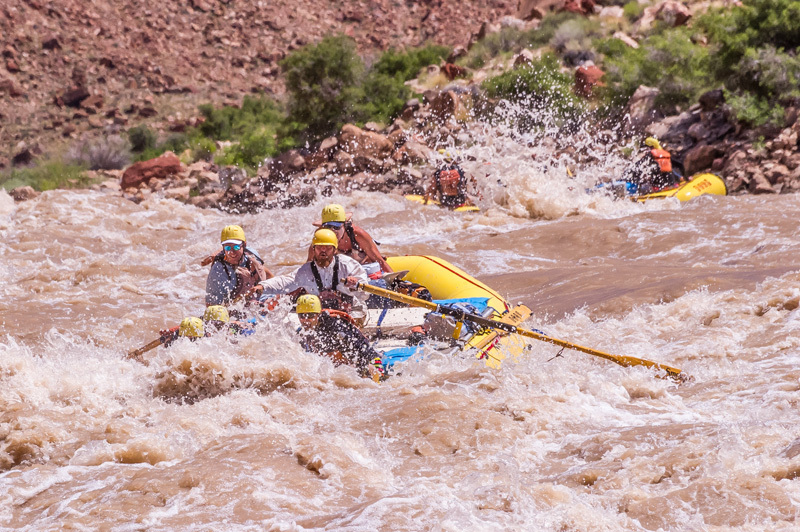 The Upper Colorado River Basin snowpack is currently tracking above the record-setting 2011 rafting season, so Cataract Canyon trips could get very exciting this year. As of now, high water is guaranteed, but just how big, and how long it lasts will be determined by the next several weeks of weather. 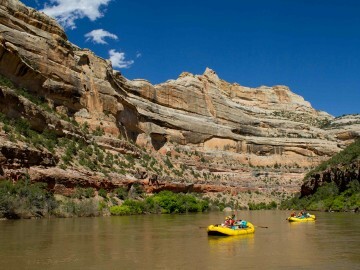 An above average snowpack in the Yampa River Basin means Yampa rafting trips are back in full effect after several seasons that were cut short due to low flows. California rafting is back with a bang after a less than stellar 2018 season. This means we’re expecting high-water conditions on many of our popular trips and rafters should be prepared for higher, colder flows through June. Additionally, early season gems like the North Fork of the American River and North Fork of the Stanislaus will be in play from April to mid-June, offering adrenaline junkies some of the most exciting and challenging whitewater in the state. 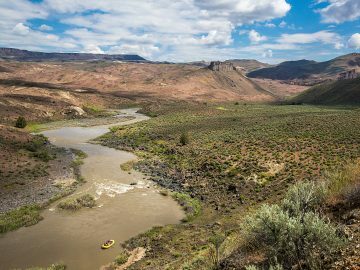 This year rafters have a chance to catch the elusive Owyhee River in southeastern Oregon, which we’ve only been able to run commercially twice in the last seven seasons. For those who hit the narrow window when the Owyhee River actually flows, likely through May this year, it’s unforgettable. In 2018, a “Miracle March” helped improve what could have been a dismal California rafting season. Meanwhile, this year the statewide snowpack—162% of average as of April 1—could surpass the “once-in-a-decade” conditions we saw in 2017 depending on the weather patterns in April and early May. 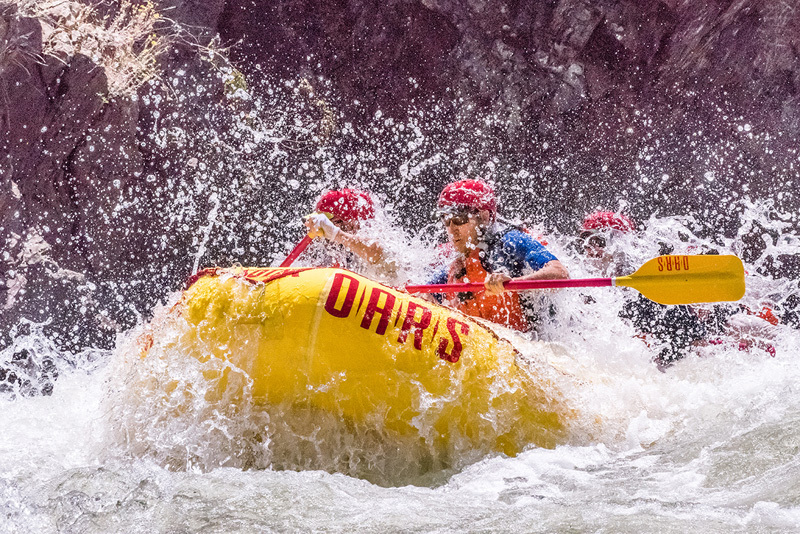 This means rafters should be prepared for high-water rafting conditions into late June, and possibly early July, on many of the state’s recreational rivers. On the popular South Fork of the American River near Sacramento, outfitters will be enforcing increased minimum ages due to higher, colder flows that are likely to last through June with more moderate family-friendly flows expected through September. During the high-water window, it’s a great opportunity for early-season rafters to combine the upper Chili Bar and lower Gorge stretches of the South Fork for a whopping one-day, 21-mile river adventure. 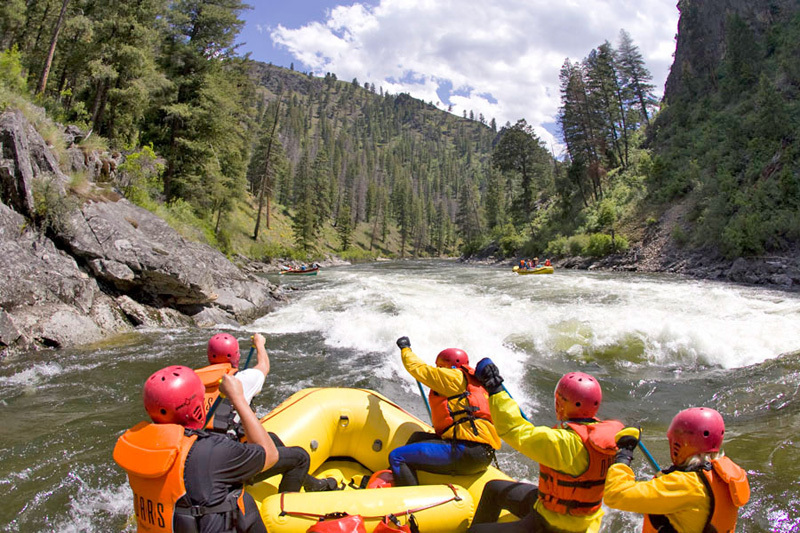 This year will also offer adrenaline seekers a longer window to experience some of the free-flowing rivers across the West that are largely dependent on snowmelt like California’s ultra-exciting (and scenic) North Fork of the American River. The North Fork will often go offline by mid-May, but rafters can expect it to run through mid-June this year. The free-flowing Merced River near Yosemite, which saw a very brief 2018 season, is expected to run April through July this year. 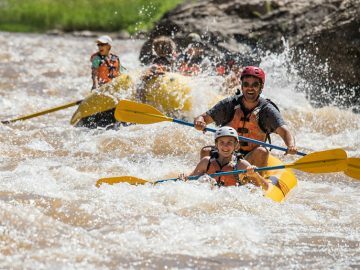 During peak flows, typically mid-May to early-June, the Merced turns into a classic big-water trip with Grand Canyon-sized wave trains before mellowing out for the remainder of the season to a more moderate trip full of fun, rollicking rapids. Meanwhile, the Tuolumne River is poised for a wild season. 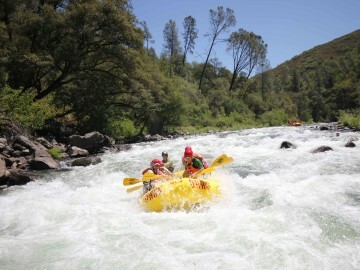 This quintessential California rafting trip near Yosemite, which can be done as a 1-, 2- or 3-day trip, is guaranteed to see some epic high water flows where paddlers will be in non-stop Class IV+ whitewater commotion for much of the trip. “We expect to run the Tuolumne through Labor Day and flows should stay above average for most of the season,” according to Moore. In some cases, outfitters may administer a swim practice at the river before allowing paddlers to board rafts. 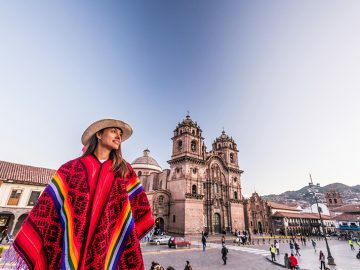 If that doesn’t sound appealing, then you might want to consider a trip in July or August. 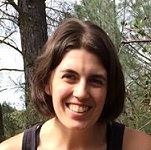 With statewide snowpack numbers above average in Utah, OARS Dinosaur Regional Manager, Nicole Lavoie, says 2019 has the potential to be another record-breaking, memory-making, season, similar to 2011 if spring weather cooperates. As of mid-March, the Upper Colorado River Basin was measuring more snow than the same time in 2011, which was the last record year in Cataract Canyon, according to Seth Davis, OARS Moab Regional Manager. What actually plays out there will be dependent on the weather and temperatures over the next 6-8 weeks, but at this point, high flows are guaranteed and will present exciting conditions for adventurous early-season rafters who want to experience the power and awe of a wild river. 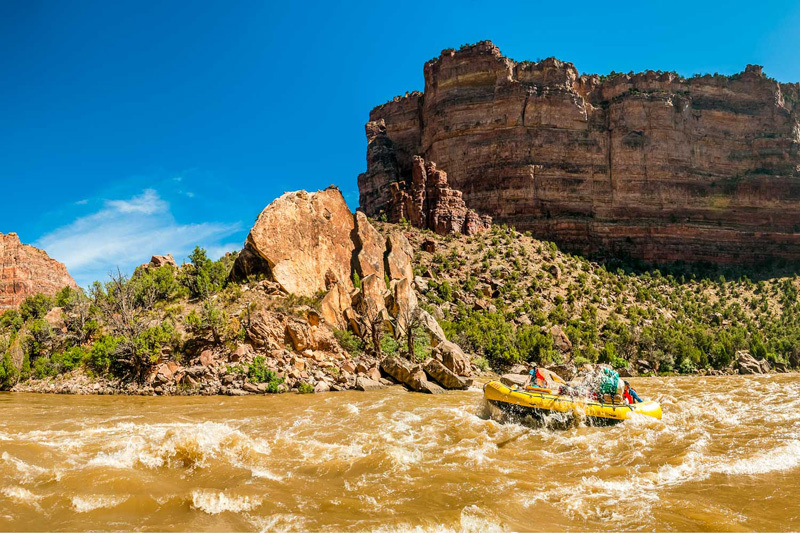 This year also marks the 150th Anniversary of the John Wesley Powell expedition, so it’s a once-in-a-lifetime opportunity for paddlers to soak in a little piece of history and follow in the footsteps of legends on an iconic Western rafting trip. 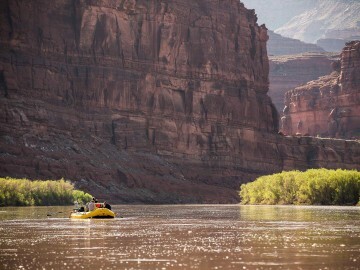 For Utah’s Gates of Lodore and Desolation Canyon trips on the Green River, two other stretches that lay claim to being part of the historic Powell Expedition of 1869, we’ll likely see exciting early-season flows with sustained water later into the summer, perfect for families. It’s good news for the Yampa River in Northwestern Colorado, too, which after a few disappointing seasons, is expected to see high water in late spring and raftable flows well into July. In 2017, the Yampa had a promising snowpack but a warm spring cut the season short, while the 2018 season suffered from a below average snowpack from the start. OARS Idaho Manager, Curt Chang, reported from our warehouse that, “February had the most snowfall in a month in Lewiston since 1916.” So it’s no surprise that the statewide snowpack is solid across the board, and slightly above average in the in the central/southern part of the state, which bodes well for Salmon River rafting trips and Snake River trips through Hells Canyon. 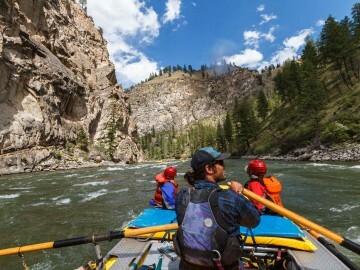 For those who are particularly adventurous and fit, this will be an ideal year to catch high water in May and early June on the iconic Middle Fork of the Salmon River, which is one of the most sought-after multi-day river trip experiences in the country, as well as the Main Salmon River. Chang notes that these more active departures aren’t for everyone though and families or rafters with mobility or physical strength limitations are better suited for summer Salmon River trips, July through September. 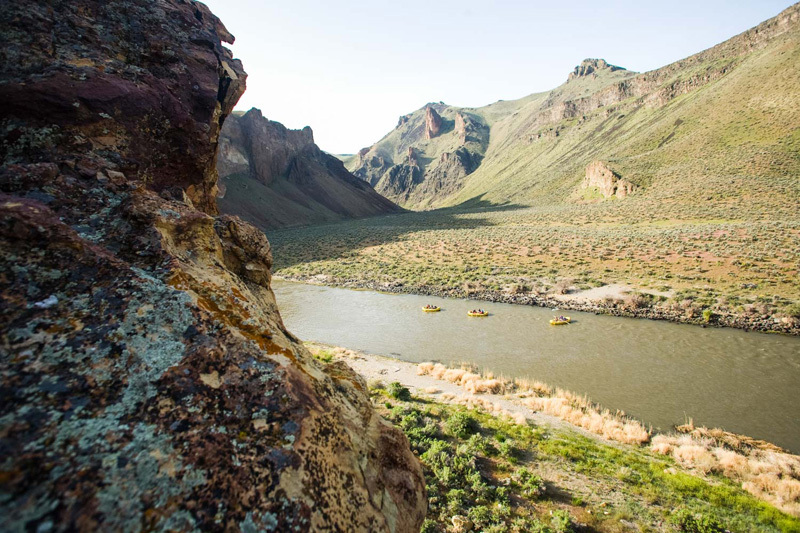 In Oregon, it’s been several years since we’ve had a reliable window to raft the Owyhee River, but with the snowpack at 123% of average as of April 1, 2019 will provide rafters ample time in April and early May to get out and enjoy this hidden gem that guides rave about. 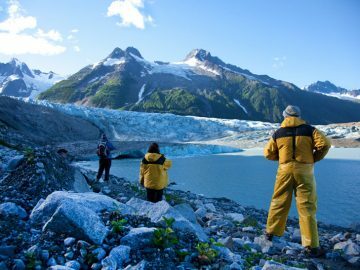 For the Wild & Scenic Rogue, where the snowpack is also favorable, it will be business as usual and families with children as young as age seven can count on reliable flows May through September.